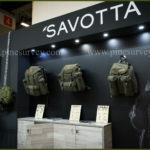 When I saw the Summit backpack during last years IWA, it immediately caught my attention. The Outback line of Helikon-Tex features some very interesting items and this backpack is certainly among them. So I was quite happy to get one into my hands to test it and boy, I was not mistaken. 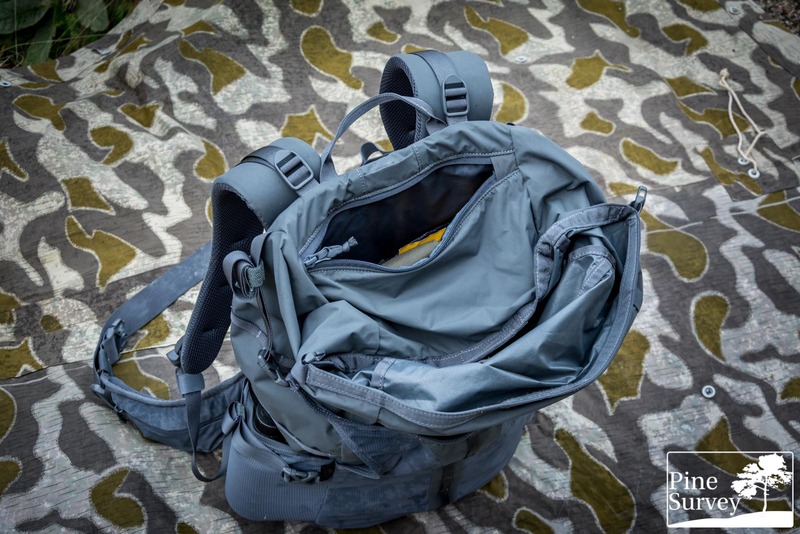 Most of my backpacks are of the tactical sort, so I am used to the heaviness of 1000D and even 500D Cordura with all the MOLLE, and webbing etc. But if you are the type for hiking and mountains you will be painfully aware of every little gramm of weight you have to carry with you. 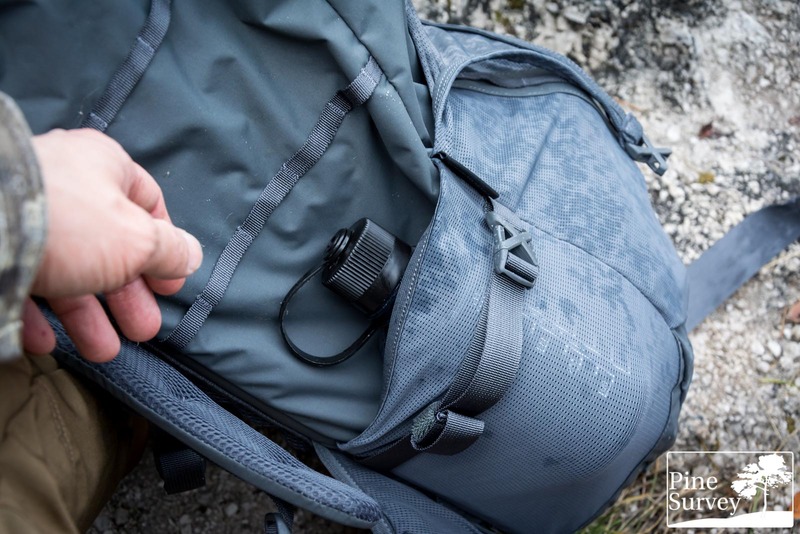 The Summit backpack ist Helikon-Tex’ approach to address the needs for a lightweight pack for exactly these kind of situations. I hope I can give you a decent impression, on what they did in regard to that. 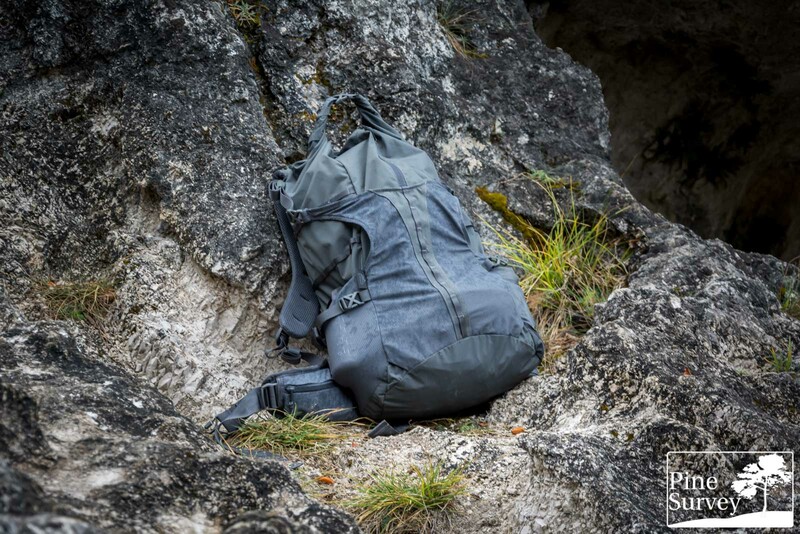 The Summit backpack is a lightweight pack specially designed for hiking and outdoor use. 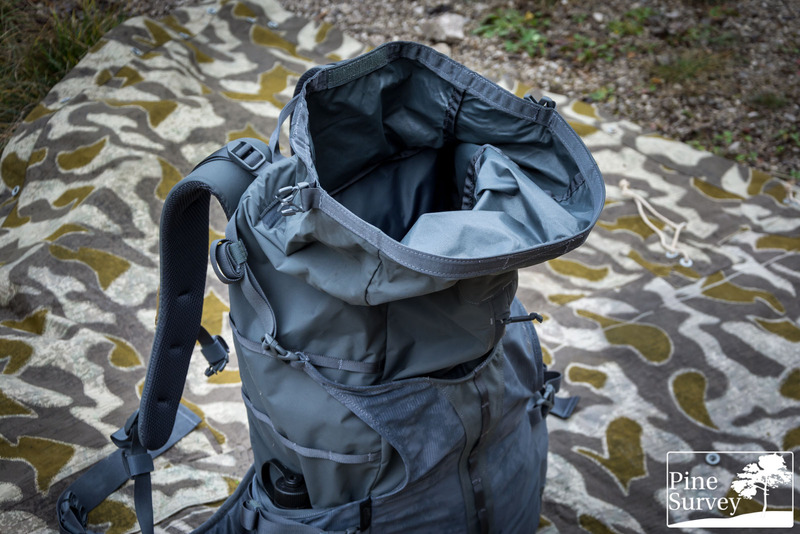 It is basically a toploader with a roll top, looking much like a dry bag (but isn’t one). Additional access is provided by a front zipper. Two mesh pockets on the sides and a mesh beavertail offer additional ways of carrying items. 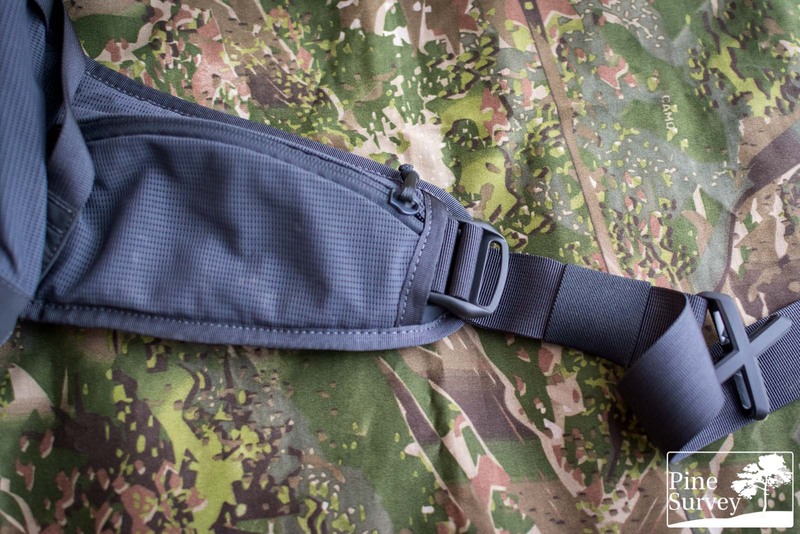 There are material loops to the front and MOLLE type webbing on the sides, to attach pouches, carabines and the like. The padded back and the hip belt (also fitted with mesh pockets) provide a tight and comfortable carrying feeling. 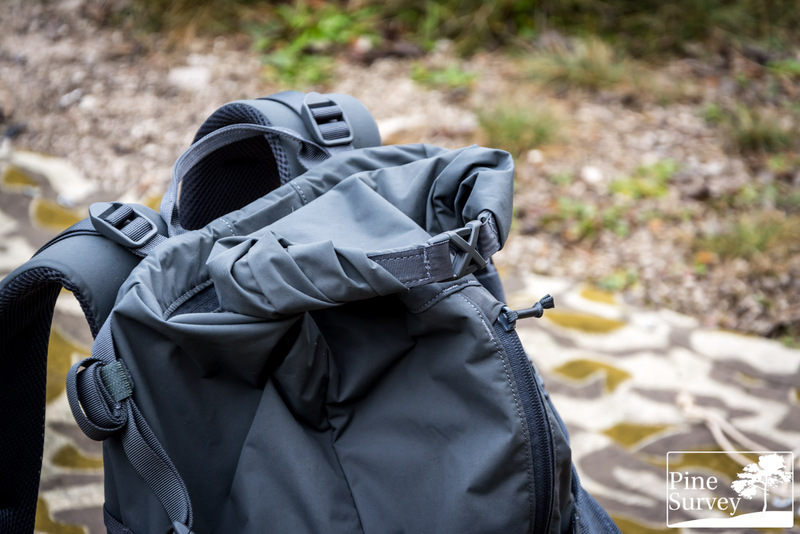 The first thing catching your eye is the obvious roll top on the Summit backpack. You might be familiar with this closing concept from dry bags. You use the back basically like a huge sack, and close the top by rolling it. If you think this means it is a toploader, think again, because this is not the only access point to the main compartment. But first things first. 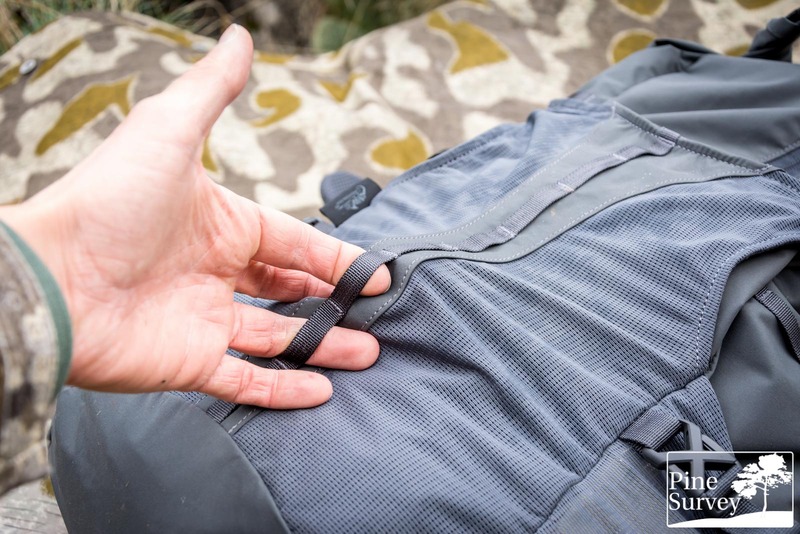 The opening of the roll top is made of a stiff webbing, featuring a velcro area in the middle to get you started and after rolling the top 2-3 times you can close the left and right end with a skeletonized Woojin buckle. 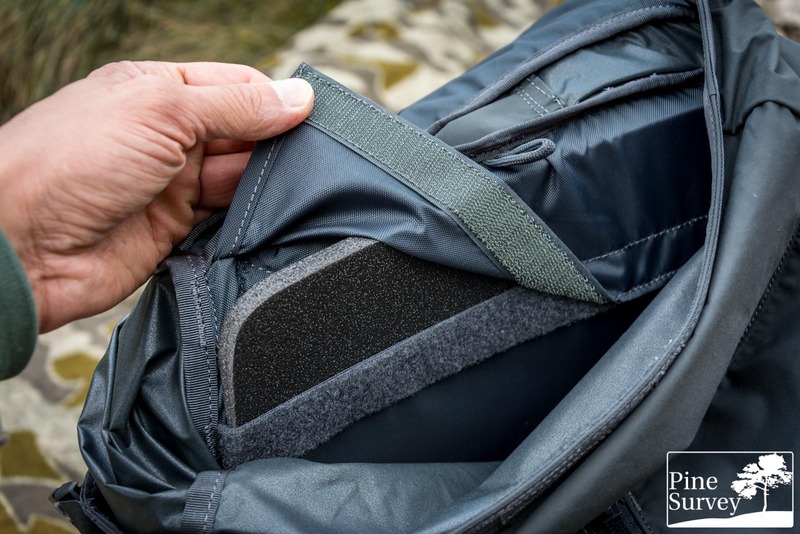 As you can see, the opening to the main compartment is rather huge and the fabric of the pack leaves plenty of room, so you can overpack this pack quite a lot if you choose to. 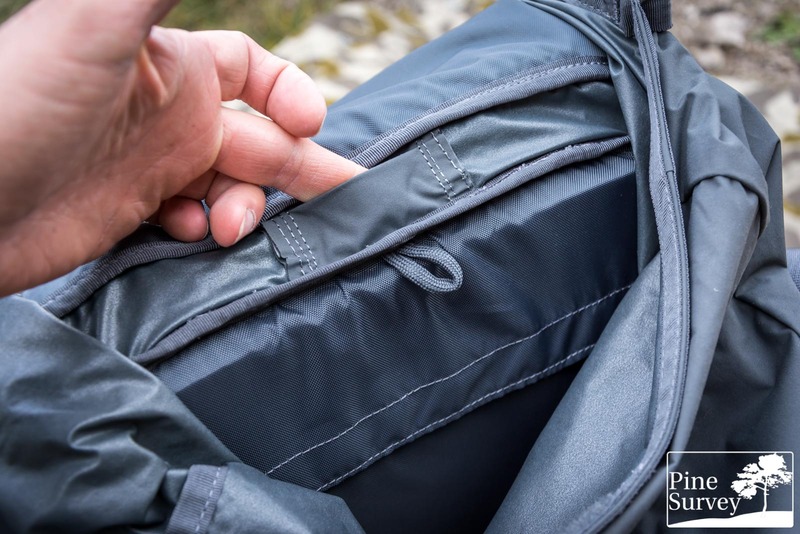 The second opening to the main compartment is a long zipper that basically covers ¾ of the front. The zipper itself is inverted, meaning you have the backside tape to the front to provide basic protection from the elements. This does not mean however that this zipper is sealed! On top of the pack you will find an additional smaller zippered pocket. 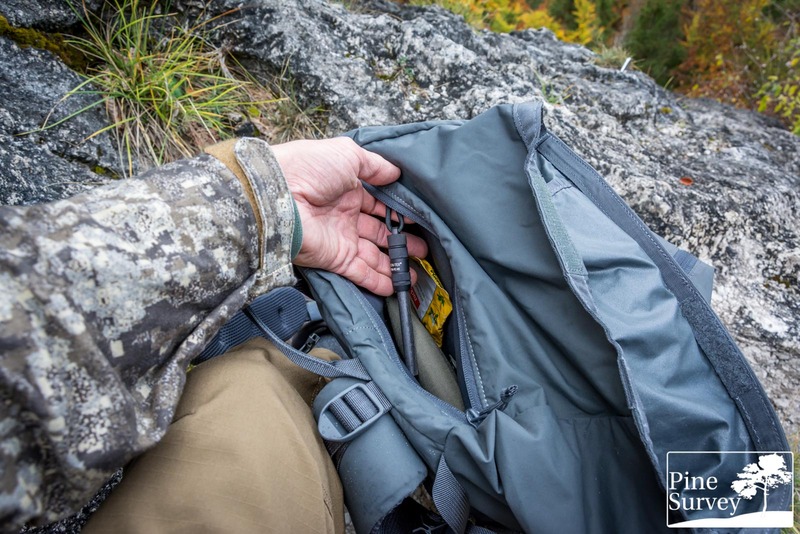 Positioned right next to the carrying handle this small pocket features enough room for items you quickly need to reach, be it your purse, a flashlight, a firesteel or other EDC items of your choosing. Right next to it is an opening for the tube of your water bladder. On the inside of the main compartment you will find a basic paracord loop to mount this bladder, but no velcro tab. There is also no sleeve on the inside to store the bladder. Besides of the compartment for the frame sheet the main compartment is featureless all due to the lightweight design. Same opening from the inside. Note the paracord loop and sleeve for the framesheet. 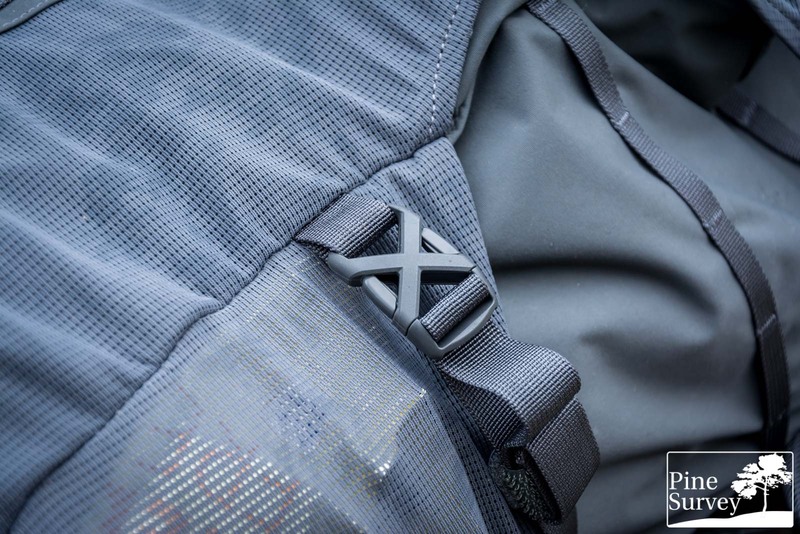 The sides of the pack feature large elastic mesh pockets that swallow quite a lot. A 500ml Nalgene is not problem at all. So everything to lighter jackets, gloves and canteens etc. have plenty of room here. 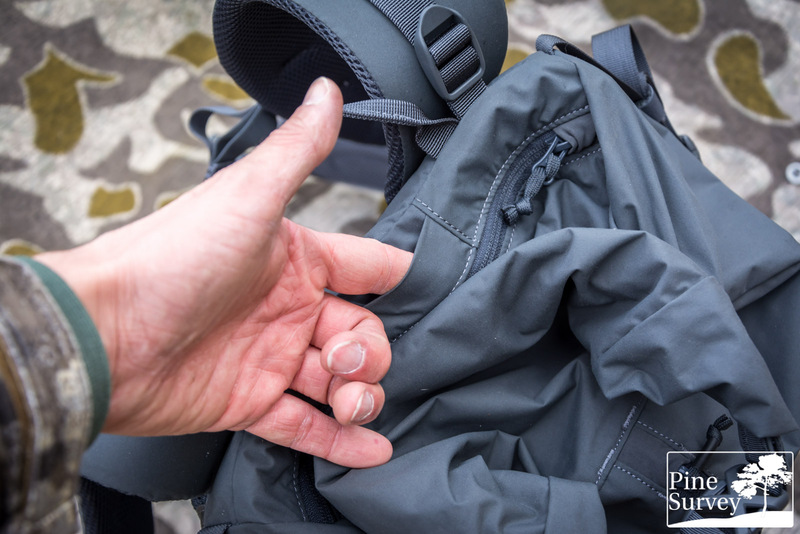 Right above these mesh pockets you will find MOLLE like webbing, which is called MOLLE light by Helikon-Tex. In the end it gives you the same measurements to fix MOLLE pouches, while at the same time saving weight by using slimmer webbing. You will find 2 rows with 5 loops at your disposal. The front features a large beaver tail made of elastic mesh. Two straps run along each side and give you the option to open it up, while at the same time acting as compression straps. The beaver tail is reinforced on its front side and features 8 vertical material loops. Here you can hang additional items. On the bottom of the beaver tail you will find drainage openings left and right. With this beaver tail, you have plenty of options to carry items you need quick access to. Be it jackets or helmets. It offers enough room. Last but not least, there are two more compression straps on the bottom. 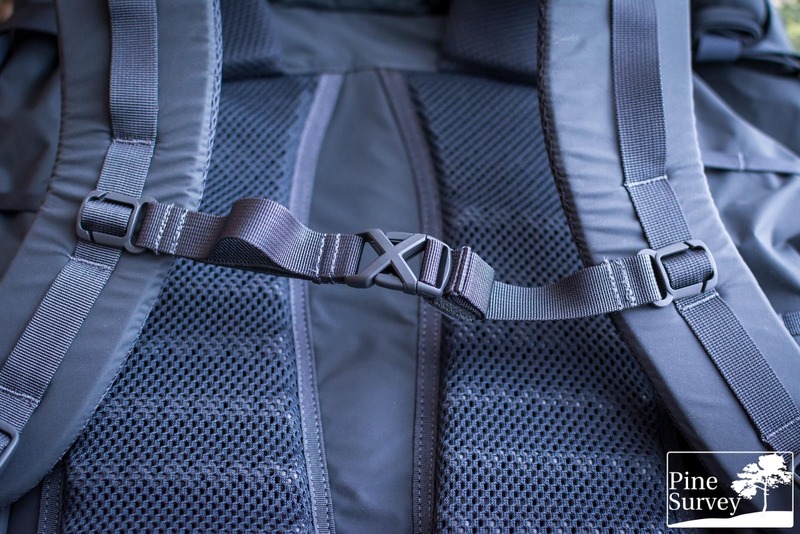 All the straps feature useful velcro tabs to deal with loose webbing. Coming to the backside. This is generously padded with the same “combat vent system” known from Direct Action packs. 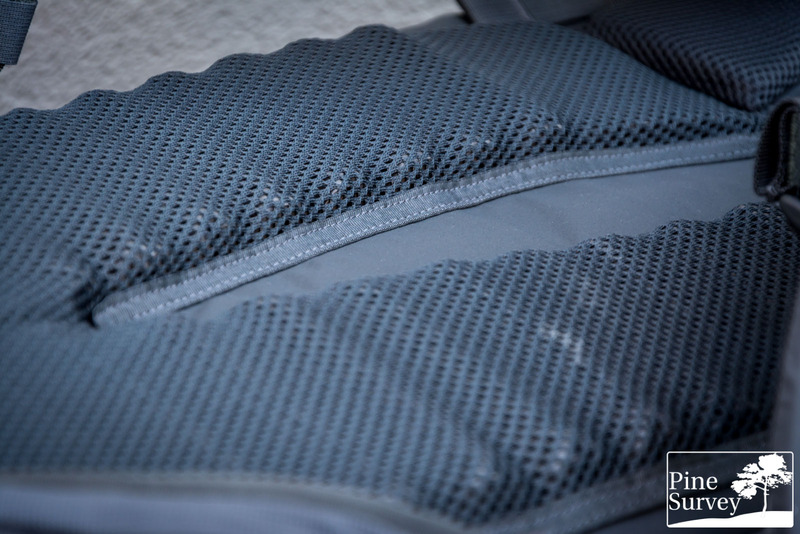 It is basically a foam with grooves, giving the back plenty of room for ventilation. Adding to this the padding runs along the shoulder plates while leaving an open room in the middle for even more ventilation. As a result you not only have comfort, but ventilation. On the inside of the main compartment there is also a sleeve with a frame sheet made of stiff foam. As a result nothing from the inside can press into you back and the whole pack rides very comfortably. This is supported by the contoured shoulder straps, which are heavily padded as well and quite wide. The obligatory sternum strap gives you the option to secure the pack even tighter to your upper body. Another thing worth mentioning is the hip belt. Two large wings provide excellent weight distribution to the hip. They are padded as well and feature zippered mesh pockets on the outside. These are big enough for purses, keys, handkerchiefs, israeli bandages… you name it. The hip belt is secured by a large skeletonized buckle and features a detail I wish I would see on more packs. And additional clasp is placed opposite of the main buckle on each wing. The webbing goes to the buckle and back to the clasp. As a result you can pull the webbing like a hoist and adjust the belt way easier. Very nice and a most welcome detail! The quality of manufacture is quite decent. You get your money’s worth and more. I always point out that the quality of Helikon-Tex is increasing constantly and this is also the case here. The new packs remind me alot about the quality of the Direct Action packs. Considering DA started with Helikon branded items before they developed into a company of its own, you can imagine that there was a huge step up in manufacture. Close stitching, bartack reinforcements, Cordura brand materials, Woojin buckles and dezent ykk zippers. So lots of good indicators for quality manufacture. Even the paracord pulls on the zippers are finished with tubing. Also you can tell they tried to save weight wherever they can, without compromising quality or stability. 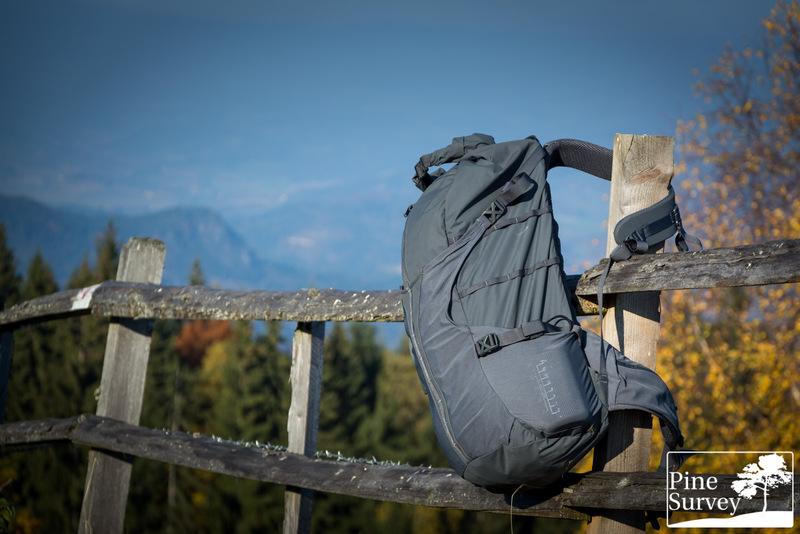 The Summit backpack is in use für several months now. So far I have had it with me from everyday supermarket runs to 15 km hikes. I have used it to travel and also to my trips to my rocky spot for my camo pics, which is quite the steep ascend. 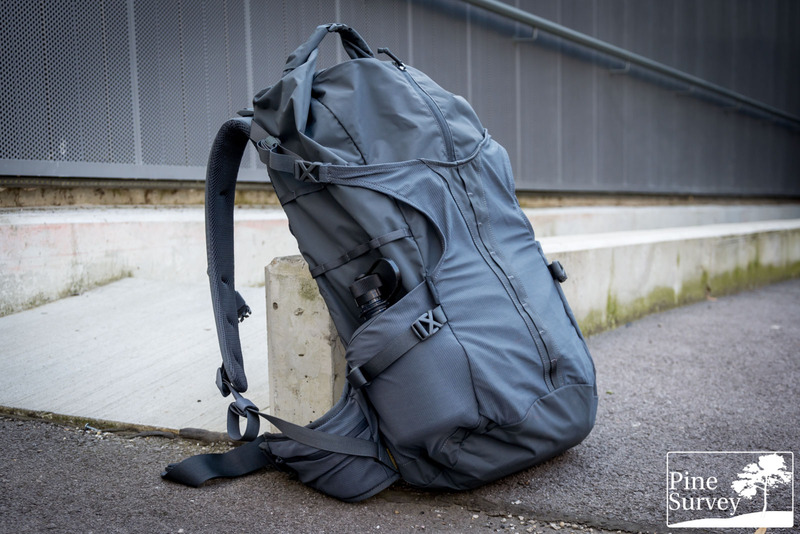 In all of these situations I learned two things to really appreciate with this pack: The lightness and the padded back with its shoulder straps and hip belt. 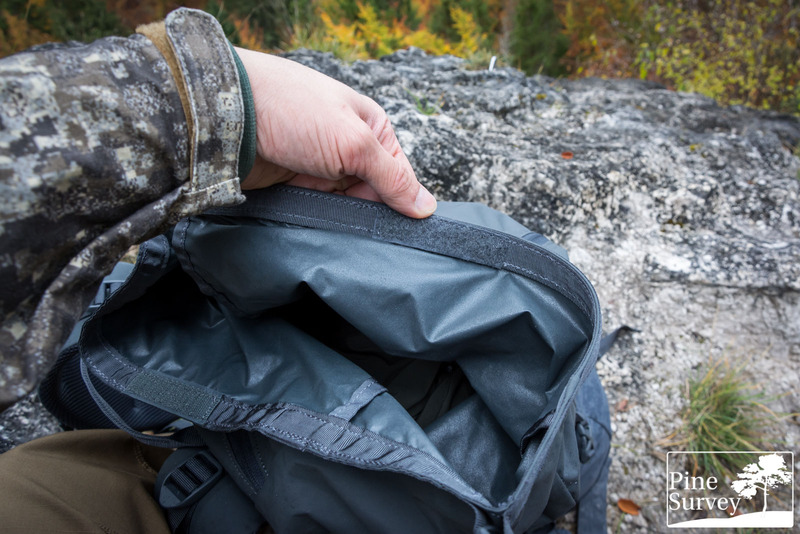 Ounces do make pounds and this is true with the Summit backpack. The weight saving is incredibly and gives you quite the advantage. At the same time the carrying comfort is wonderful. Correctly adjusted to your needs, this pack stays where it is supposed to and doesn’t wander around. Especially during steep ascends you get to experience this. Other than that it follows the principle of KISS. No unnecessary features you barely use anyway. Just the essentials. Impressive. The front zipper to the main compartment is only rarely in use with me. 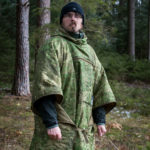 Sometimes it is nice to have to get to items which are closer to the bottom, but the placement in the center in combination with the beaver tail sometimes restricts the access you could have, if it was placed at the sides – but then symmetry would be gone and you could not place MOLLE at the sides… as you see… decisions. Another thing worth noting. Even though it might look like it, but this is not a drybag. It might look like one, but the front zipper is not sealed. So be aware of that. The skeletonized buckles are a nice feature, but I am curious how long they will hold up. One annoying thing I noticed is that you tend to miss the opening when closing, actually putting the buckle into the sides – but this could just be me and my lacking fine motoric skills. 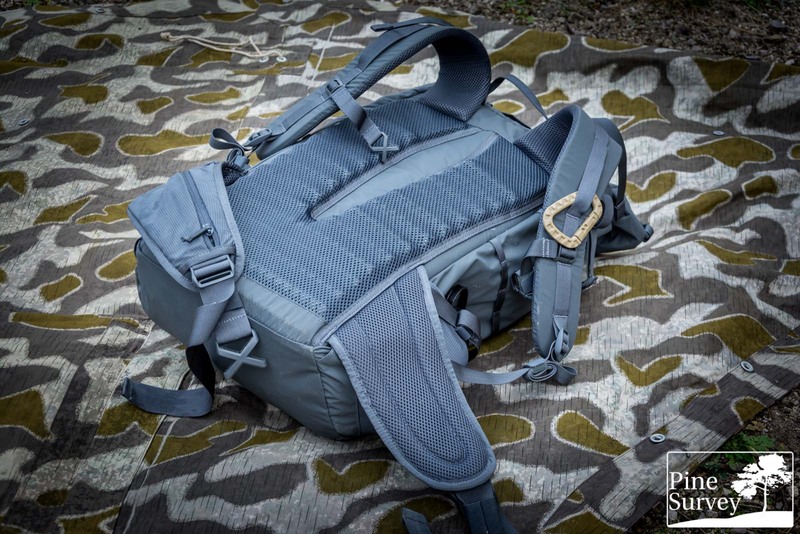 Helikon-Tex put lots of thought in this pack and certainly did not disappoint. 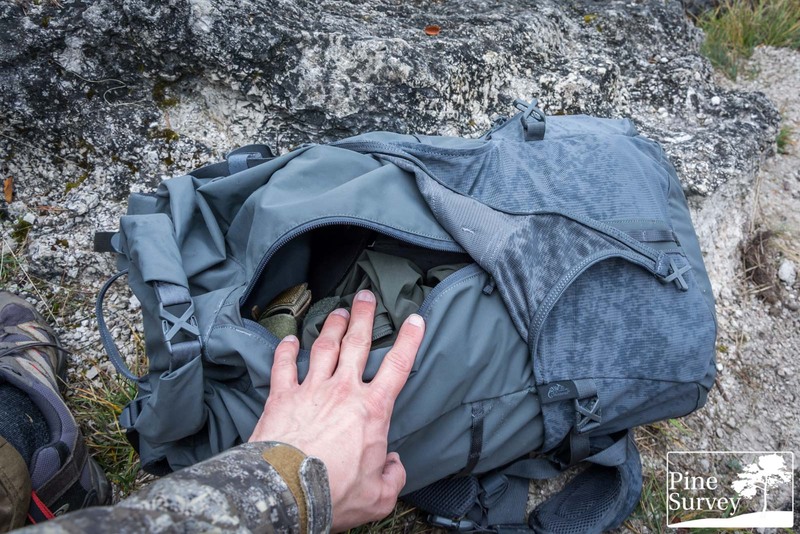 Even though there are not that many pockets, sleeves and hidden compartments, the Summit backpack actually wins by offering only the essentials. Details you actually do use. 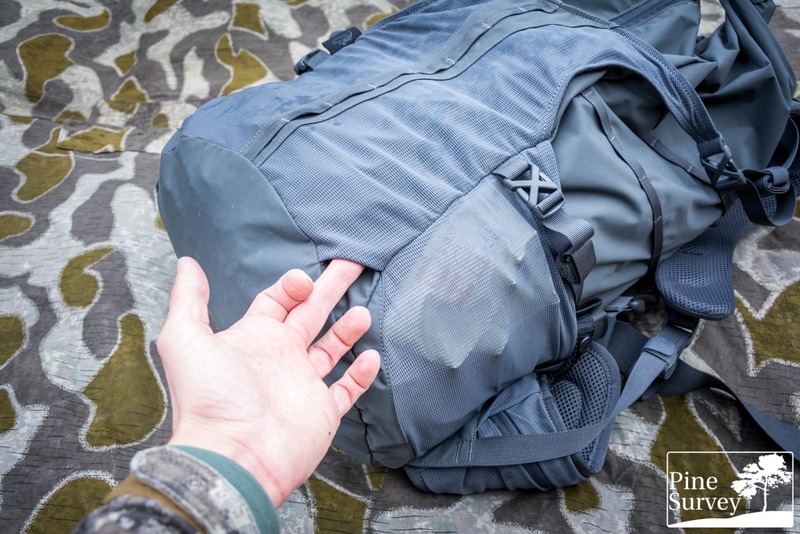 And while the pack is extremely light weight, it did not compromise on the load bearing system, giving you a comfortable and light pack as a result. The pictures and above mentioned remarks speak for themselves. With that being said, I hope I was able to give you another decent review and insight into this particular pack. Thank you for reading and many thanks to Helikon-Tex for giving me the opportunity to write this review for you guys!